The Eppendorf 5415R Refrigerated Microfuge is a great tool for research and tissue culture studies. The sleek and small design is extremely desirable in today’s congested laboratories. This easy to use microfuge includes a maintenance free motor and tops out at speeds of 13,200 RPMs. The Eppendorf 5415R comes with a fixed angle rotor for 1.5 and 2ml tubes and has a capacity of up to 24 tubes. These refrigerated microcentrifuges comes with digital controls and LCD display allowing the using to toggle between RCF, RPM, timer and temperature. The Eppendorf 5415R includes a motorized lid and has a temperature set point range of 0° to 40°C. Microcentrifuge comes with features such as short spin, continuous run modes and increase speed in increments of 200 RPMs. The Eppendorf 5415R Refrigerated Microcentrifuge runs smooth were particles that have been pelleted are not accidentally re-suspended. 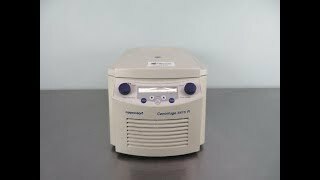 Contact us today to learn more about our Eppendorf 5415R Refrigerated Micro Centrifuge. This used refrigerated microcentrifuge was tested by our technicians to ensure instrument was performing a factory specification. The 5415R microfuge is ready to ship with a 1-3 day lead turnaround time. If you have any questions feel free to give us a call, or fill out the contact form.